Making the Oculus Rift has been no easy task. Sure virtual reality has been around for awhile now - various iterations have been experimented with since the 1950s if you can believe that. But the interest died out every other decade - until now. Lately, it looks like VR is going to stay. With high end devices hitting the market soon in the form of HTC Vive and PlayStation VR (formerly Project Morpheus), it's obvious the hardware and software has vastly improved. With every prototype, we get more antsy and impatient - the tech and its potential are just too damn cool not to have immediately. This is most apparent with Oculus and its many, many iterations. It began as a Frankenstein of miscellaneous virtual reality headset parts duct taped together. From that, it became the vomit inducing DK 1, then the slightly better Crystal Cove, the improved DK 2, the audio-enabled Crescent Bay and finally the long awaited, feather light, consumer Oculus Rift. Clearly, hardware has been extremely tricky to figure out. It's why we've seen so many headsets, and why it's taken so long to see a finished product from Oculus. Two Rift project leads gave a talk at Oculus Connect 2 to tell everyone just how arduous engineering the hardware has been because unlike software, you have to get it right on the first go. No one has really sold commercial virtual reality head mounted displays (HMDs) until now. Back in the day, headsets were cumbersome, ridiculously expensive and some were even a bit dangerous. That means what we're getting very soon from Oculus has been the result of lots of research - and lots of headaches to avoid past blunders. It's taken awhile (about three years from when Palmer Luckey began the project) because each little piece of hardware has been painstakingly crafted for you. During the keynote, "Shipping Hardware: The Evolution of the Rift," Product Design Engineering Manager Caitlin Kalinowski and Hardware Program Management Manager Stephanie Lue say that because of the carefully made pieces and the newness of VR, interdependent processes were needed. Members of the team needed to work together simultaneously and parallel opposed to the linear way of creating products. Much of the difficulties lie in the intersection of the different sciences. Industrial design merged with engineering and many people had to compromise, improvise and work together to figure out how to make a good, working HMD. Kalinowski say, "Hardware unlike software, is shipped once. You can never update it so we have to work really hard to make it the best." Comfort, immersion and presence are three key tenets the Oculus team followed during research and development of the hardware. There are plenty of challenging aspects that went into the head mounted display, Lue and Kalinowski focused on IPD (interpupillary distance), fabric, straps and audio. Because our heads vary in shape and size, along with the distance of our eyes, very specific measures were used in making the gear train and the straps. Adjustments must be smooth, easy to figure out and able to fit everyone. The same can be said of the audio clips. The team wanted them to be removable so you can use your own audio devices, adjustable to flip up/out and individualized for different ear types. The pieces also had to be easily manufactured for mass production. Surprisingly, the fabric covering the headset has proven to be a major challenge for Oculus. In order to achieve the three points mentioned above, the material had to meet certain criteria. The sensors for head positional tracking needed fabric light and stretchy enough while also being comfortable and pleasing to touch - we don't want to strap wool onto our faces. Lue stated the fabric also needed to fit around the plastic device properly and efficiently for manufacturing purposes. Kalinowski says the process is akin to trying to cover a beach ball in wrapping paper but without any wrinkles at all. Oculus went all over the world searching for the right kind of material but ended up creating a custom fabric. After multiple trial and error combinations, the team finally produced the finalized version of Rift - in fact, they all went to the factory to make sure the machine-assembled device worked, and amazingly, it did on the first try. While both Lue and Kalinowski are obviously proud of the work Oculus has done, they made it clear there's always room for more improvements. According to Kalinowsky, given enough time, an engineer will perpetually keep tinkering away. But Lue says there are still deadlines to maintain to ship as soon as possible. 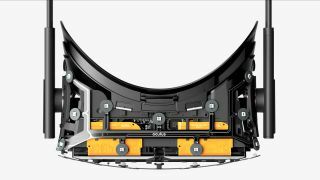 Oculus is still trying to figure out how to make the HMD more comfortable for people who wear glasses by exploring different ways to incorporate the foam surrounding the face plate. It's possible there will be add-ons you can purchase later once the issue has been resolved. For now though, Kalinowski says they wanted to make something "beautiful and elegant, comfortable and works well." Through this labor of love, it's apparent the Oculus team feels they've achieved this goal. Whether everyone else will feel the same way when Oculus Rift arrives early next year is up in the air. From my experiences with the Rift, I'm confident all their hard work will shine through into reality.